An $8-million “marquee” luxury-condo development planned for Wortley Village is whipping up debate in the historic neighbourhood. But some nearby merchants are concerned the building will add to existing parking problems and some residents say the size and design is not a good fit for the neighbourhood. 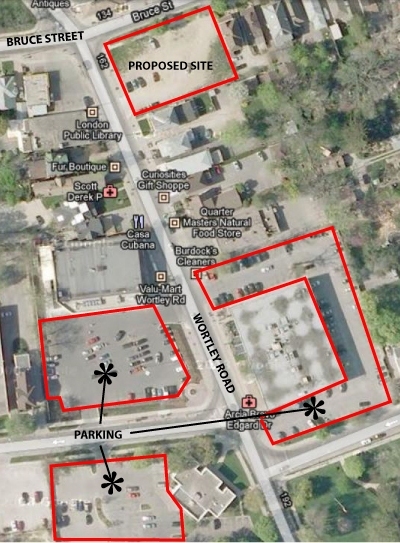 The proposed four-storey building would be built on a parking lot at Wortley Rd. and Bruce St. The building would have about 24 luxury condo units priced from $250,000 to $400,000 and 6,000 square feet of ground-floor retail space. The development would have a two-tier parking garage with 36 parking spots for residential and retail tenants, eight spots short of city requirements. Because of higher ceilings in the condo units, the building would be slightly taller than the 12-metre limit allowed under city guidelines. Parking shouldn’t be a major issue in an area where pedestrian traffic is common. “It’s not like a suburban shopping mall. The retailers we are looking for are expecting street parking and pedestrian traffic,” said David Tennant Jr. of developer, the Hampton Group. Only 15 businesses in the immediate area of the development were notified by city officials about the details of the project. The Old South Community Organization sponsored a meeting Saturday morning on the issue at the Landon Branch of the London Public Library. So, the local business owners main concern is with parking? It’s a very walkable village, all necessities are provided within a 10 minute walking distance, so why should parking be a major concern? All this empty lot has done the past few years was become an eyesore to the village. People have gotten used to parking in this lot, and don’t want to see a change. There is plenty of parking still available in the area (the grocery store, bank, etc.). Get rid of the eyesore already!! Oh and the design of the building and site looks really quite nice, it’d be nice to see something new in the area. Entry filed under: London. Tags: Condo, Condominium, Garage, Hampton Group, Parking, Pedestrian, Wortley Village. It is NOT about parking, it is about having a Glass Monstrosity being placed in our old victorian style neighbourhood. Im sick and tired of the excuse of parking…im not sad to see the dust bowl go, I am sad to see a money grubbing developers come in with their cheap construction design, and without any care as to what others think…They are ONLY concerned about their profit. Im sure these condos will sell quickly. My concern is the exit from the parking lot on Bruce street, and the fact the most drivers in this city DONT know how to Look both ways while exiting onto a 1 way street. The parking lot concrete is right at the side walk, and with Bruce Street being a one way east bound road, most drivers will be starring left (west) as they pull out of the drive way, without looking right. It happens ALL the time at the IMPark infront of the Convention Centre to me almost EVERYDAY walking home from work. SOME ONE WILL BE HURT. Drop it a level, and wont need so much parking. As well, more brick, and more victorian style windows. Give us something nice to look at, and dont try and make this building the centre piece of Old South, we have one…THE NORMAL SCHOOL! Is it too late to stop them! ?…This will completely distroy the look of Old South….I’ve lived in this neighbourhood for 44yrs…I’ve seen a lot of changes for the good…this one will be the undoing of our beautiful Village…the traffic is already bad enough…people are not a curtious anymore…so just imagine what this condo will bring…it will be a cancer to Old South…if this is allowed to happen…we should just plant a tumbstone on that property instead!!!! Ever been to Europe after the Great Wars and seen the modern architecture mixed with the classical? Ya, that’s what I thought! It’ll look nice, don’t worry, be happy. Oh ya!! My husband and I have seen what modern architecture has done to the many of the European cities we have visited….we just loved it when we were walking through Florence enjoying the beautiful historical buildings….when we turned a corner and the magic was killed by a brand new building with a McDonalds in it….Did you happen to ask the people of Old South if they wanted a monstrosity in the middle of their village or are you just as arrogant as the Europeans who came over and gave the native people no choice!!! SOMEONE NEEDS TO BUY THE MORONS OUT AND TO LEAVE OUR VILLAGE ALONE!!! !….WE LIKE IT THE WAY IT IS!!!!! Haha, just trying to start some friendly debate. I used to live in Old South as well. My Uncle has had his business there for well over 20 years now. If you’re really upset about this, I recommend talking to City Hall and setting up a community meeting/design charette. I believe there are Urban Design Guidelines for Wortley Village, but I’m not 100% sure. Ps. I do in fact love modern architecture, maybe it’s just a generation gap or something? Berlin has got to be my favourite “modern” European city that I’ve has the chance to visit so far. And no, I’m not arrogant. I just like to have an open mind about new things. Change can be good, think about future generations. I don’t mind a development if there is some green sitting space or cafe space in that the building isn’t close to the curb but a good distance away from it. I like the idea of retail space if each unit is accessable from the street. This would be consistent with small shops that is part of the look of the area. In Europe you see people sitting out at small parks or cafes and chatting with passerbys. It would also be nice if the building was a style that was consistent with the old south hertiage buildings. A big square box is very unattractive and does not suit the area. I’m not so worried about parking because one of the things I like about Wortley village is that it is walker friendly and encourages people to walk from shop to shop. There have been significant updates to the building plan and additional parking has been added. you can go to http://www.oscolondon.ca/whats-new/60.htm for more info. I understand concerns about the look of the building. Sure, we want it to fit into the eclectic village vibe that Wortley has going on. However, explain to me how the Valumart, steel, boxey building fits this “village feel”? Or the Wortley Roadhouse building? These buildings are horribly designed, ugly, modern constructions that certainly take away from the village vibe, but they remain. This is a new build that has drawn a lot of attention to Wortley Village for the last 2+ years. The developers, Hampton Group, were more then willing to work with residents on the exterior design to make it appealing, as the more appealing it is on the outside, the more easily they will sell their units! Due to the OMB appeal, Hampton Group ended up having to sacrafice an entire floor in order to satisfy some ridiculous bylaws, thereby losing 7+ units, which equals 7+ more families coming to Wortley, spending their money in the cafes & shops, decreasing the village’s chance to grow economically and socially. Wortley could bring some new business to the village, but space is completely limited as we all know. This is a nicely designed new building that will open up many commercial spaces for new business and promote growth and prosperity for the village. While, I certainly can appreciate long-time villagers’ concern, not all change is immediately bad. Perhaps we are not focusing enough on the extremely positive change that this will bring for all of us ‘villagers’. As a final note, I have to say that in my dealings with Hampton Group, I have found the staff there to be extremely helpful, considerate and not the so-called “money grubbing developers”. Have you spoken with them? Once you do, you will realize that they are a fairly small developer in London and are the exact type of people/company that you would like to have taking on a project like this in a village that wants to hold onto that small-town feel. Together, we can all benefit from this and add to the charm of Wortley. I have been wondering about this building since construction began. My main issues with it are 1. Wortley street in that area is all businesses, it just seems weird to put condos there. 2. There will be very little green space as the building takes up the entire lot. 3. The design while pretty does not fit with the rest of the neighborhood. One of the things I love about wortley village is the heritage homes and buildings. I love feeling like I’m not in a big city while still being close to downtown. What is with all the negativity around the new condos? If people are concerned about the appearance of buildings in this wonderful part of London let’s look at getting rid of the concentration camp-like fence in front of the grocery store, the infringement upon access to the sidewalk in front of various coffee shops,..my list could go on. Replacing an unsightly dirt lot full of cars with a clean, neat, stylish building is a step in the right direction. It get rid of an eye sore.